Is a cloud POS system (also known as web POS software) the right point-of-sale (POS) system for your business? And what exactly do these terms mean anyway? Here’s the low-down on what these words actually mean and the benefits compared with a traditional server-based POS. A cloud POS is a web-based point-of-sale system that lets you process payments through the Internet — without clunky and expensive servers or pricey software that makes you buy a new version to upgrade. Cloud-based point-of-sale systems process all payment transactions and updates online, rather than on your local computer. With Square’s cloud POS software, your transaction and sales history are securely stored in the cloud, too. 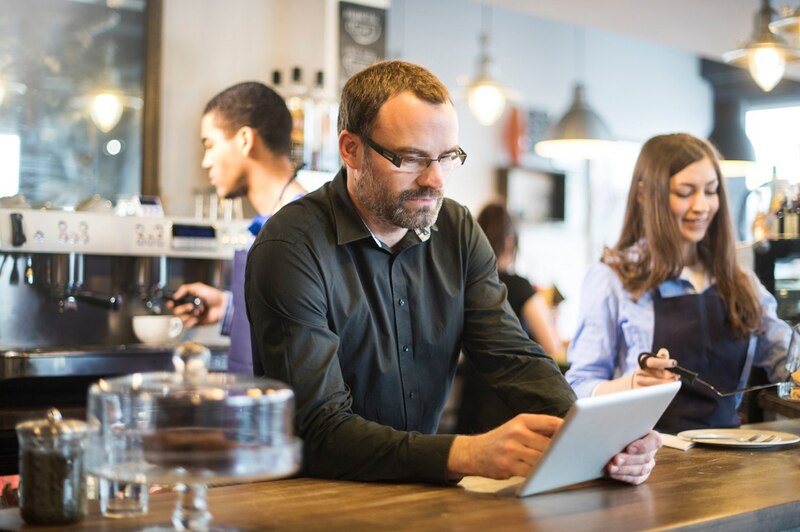 Rather than being tied to a shop counter setup like a traditional POS running on a desktop computer, cloud POS systems can run on any device — including tablets and smartphones. This is ideal for mobile businesses (from street food trucks to plumbers). It’s also good for brick-and-mortar businesses looking to create a cleaner, more modern setup and speed up queues by taking payments from multiple points. In addition to making on-the-go sales with your device, you can also access your point of sale from wherever you are to send invoices, manage your inventory in real time, pull sales reports and view analytics. Sign up free here. What does “cloud POS” mean? When used in the context of computer software, the word “cloud” is just a fancy way of saying “internet.” Cloud POS software is synonymous with “web-based internet software.” When a product is hosted in the cloud, it just means the software and data are stored and accessed on the internet and not on your device. It’s no coincidence that so many small and medium-size businesses are choosing a web POS. A cloud POS system has distinct advantages over a traditional server-based POS. By taking card payments with a web-based POS system, your business eliminates the need for bulky, expensive server systems and a costly upfront POS software license. There are generally no annual maintenance or support fees, either. And because software updates are as easy as updating your app, you can rest easy knowing you’re taking payments with the most current, secure version of your web-based POS software. Having solid security measures in place is crucial to keeping your business and your customers’ sensitive credit card information safe. Square’s cloud POS software also eliminates the need for PCI compliance audits. We have a team of PCI experts that completes annual Level I audits so you don’t have to. We also use tokenization and robust data encryption to keep your customers’ card information safe. The chart below outlines some of the benefits of Square’s cloud POS compared with a traditional server-based POS. All-in-one solution? Yes — software, POS hardware, and analytics No — you need hardware rentals, merchant accounts, etc. Term commitments? Never Sometimes — traditional solutions may charge for maintenance or service contracts. Square offers a secure, easy-to-use, and affordable web POS. Here are the top nine reasons Square’s cloud POS system helps you run your business more efficiently and effectively. Sign up for a free Square account here. No hidden fees. When you take payments with Square, there are no term commitments. Additionally, Square Point of Sale (our free web POS solution) has no monthly SaaS or cloud POS fees. Accept payments on any device. Take credit card payments with a smartphone or tablet using our Square Reader. Or let clients pay when it’s convenient for them with Square Invoices. Easy app integrations. Run your whole business through your web POS. Integrate with the e-commerce solution you already have. You can use leading third-party accounting software that connects seamlessly to Square. Check sales analytics from anywhere. You can even check sales analytics from multiple locations right on your smartphone. However you choose to accept payments, you have all the sales data in one place, accessible from wherever your day takes you. Easier inventory management. Manage your inventory free from anywhere and make sure you always have the right amount of stock on hand. You can build a custom POS. If you need custom cloud POS software, developers can build you a tailored system with Square’s Point of Sale API. Cloud POS systems are more secure. PCI compliance and payment security is our problem, not yours. Your data is secured in a robust data centre using tokenization, and it’s never stored on your device or locked in your personal server room (which could be easily hacked or peeked into by an employee). No costly software upgrades or IT maintenance. Maintaining your own data server on your property is costly and time consuming, and it takes up precious space. With web-based POS software, you don’t have to worry about any of this. Easy to get started. No need to wait for a lengthy merchant service review process — sign up online for a free account in just minutes. Now you know the benefits of a web-based POS system for taking payments and making it easier to run your business. Get started with Square today.